Light in more ways than one – US lager’s missing ingredients | LAGER FRENZY! Beer and Philosophy. Two subjects that go together surprisingly well. Or not surprising really if you’ve ever spent an afternoon or an evening putting the world to rights over a beer. 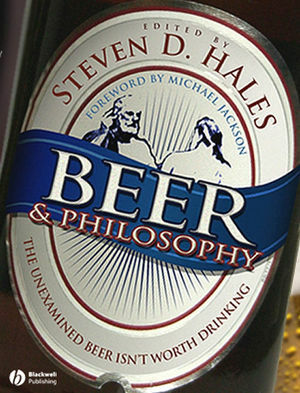 The two subjects also go surprisingly well together in a book of the same name, Beer and Philosophy: The unexamined beer isn’t worth drinking, edited by Steven D. Hales. What has this to do with lager I can hear you asking? Well, if philosophy is all about the examination of our human lives and how we experience them, then questions such as ‘How on earth can people brew Budweiser with a straight face’ are extremely relevant. And Beer and Philosophy doesn’t disappoint, with some interesting background on what goes into US lager – or perhaps that should be what doesn’t. What makes beer good or not good is one of the themes and crops up repeatedly in the book. Is a beer good because I like it, or do I like it because it is good? Also, it questions what makes a beer good. The chapter entitled ‘Quality, Schmality’ looks at ‘goodness’ by considering what goes into US lagers in terms of the type and quality of malt and the amount of adjuncts and hops. 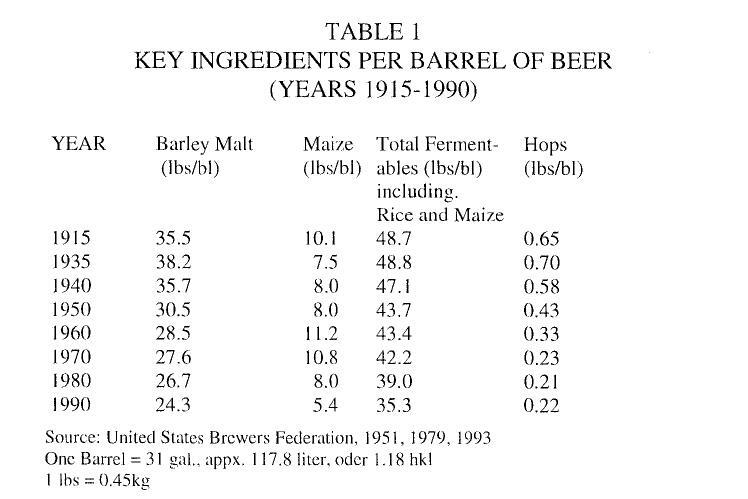 And the authors reproduce an interesting table that shows that since 1915, the amount of fermentable material has fallen consistently. The amount of hops in US beer fell by 60% from 1935 o 1990. The table by the way comes from a paper entitled The all-American beer: a case of inferior standard (taste) prevailing? This entry was posted in Beer, Brewing, Brewing history, ingredients, Lager, US lager and tagged beer and philosophy, Budweiser. Bookmark the permalink. Interesting review. I’ll check out the book. I suggest a book that I read a few years ago called – The World In A Glass: Six Drinks That Changed History by Tom Standage. It’s not lager specific but beer does get a shout out as the six drinks are: beer, wine, spirits, coffee, tea, and coca-cola. Surprisingly water doesn’t get any love from Mr. Standage. Perhaps the obvious choice of water wouldn’t have sold as many books.